“If I could give 100 stars, Tracey/Heart Melting Events would receive them! She was one of the most critical elements of executing our perfect wedding day. Since I'm not a wedding guru, she took time to sit down with us and go over some aspects of the events that we were perhaps not aware of (ex: processional order), and any other possible detail that could have come up. She was extremely flexible and willing to help with whatever needed to be completed on the wedding day. 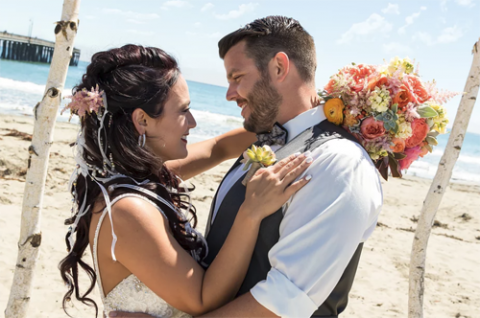 I actually felt RELAXED, happy, and completely stress-free on my wedding day, and this would not have been possible without Tracey and her team. They kept everything on schedule, the day flowing, and the bride and groom happy. Really, what more could you want? She is AMAZING." "Tracey was AMAZING! We had a very large wedding of 300 people and a bridal party of 16 and Tracey and her assistants never missed a beat! My family and I had such a carefree, fun wedding weekend because Tracey was so professional and efficient! She made everything come together and I didn’t have to lift a finger on my big day which made it so fun and relaxing! She also had great ideas that added a special fun element to our wedding that guests loved!" "Tracey with Heart Melting Events was an absolute dream to work with! She was so incredibly hard working, quick to respond, and had such attention to detail. She was also able to give us some amazing suggestions to make our day more beautiful and flow more smoothly. My husband and I called her our "glue stick" the whole time because she literally held our event together. Our wedding went off without a hitch, no mistakes, perfectly on time, and extraordinarily beautiful. Future brides, if you are looking for a solid coordinator for your wedding, hire Tracey!! You won't regret it!!!" "Book them!! They were so sweet and kind! Extremely organized and helpful on my wedding day and for all of the preparation before. They are so hard working and they made my wedding day a breeze!" "You might be thinking to yourself, "Do I really need a wedding coordinator?" The answer is YES, and that person should be Tracey. She is truly amazing and was absolutely ESSENTIAL to my wedding day! We hired her as our month-of coordinator pretty early in our planning process, because we knew that we wanted to plan and design things ourselves but have someone there that day to execute everything. And that's exactly what Tracey did. She was there to set up and take down all of the decorations, corral the vendors/guests as they arrived, make sure the timeline was being followed, and just generally ensure that everything was running smoothly. She even helped with little things like the boutonnières and my bustle (which no one could figure out). I felt so at ease just knowing that Tracey was there taking care of things, which allowed me and my family/friends to relax and actually enjoy the day. I don't even know how people have weddings without a day-of coordinator! I would have been running around panicking if she hadn't been there. To top it all off, her personality is wonderful-- she's friendly, energetic, and professional, as well as the most organized coordinator that we met with. Even my guests commented on how on top of things she was. I highly recommend her!! Thanks, Tracey!" "Tracey was my two month of coordinator and she was FANTASTIC! She was always available for me when I was stressing about the wedding. She would reassure me that everything was going to be great and that even if anything went wrong on the day of I would never know and everything would be prefect. Everything was perfect and I had the wedding of my dreams! I cannot thank Tracey enough for making my special day truly amazing. She was everything I hoped for and more in a wedding coordinator and I am so happy I chose her to be apart of my special day."